It is a very interesting thing when we just sit back and analyze. You can be sitting in a very public place and yet feel very alone. Everyone keeps to themselves. Stays in their own conversations. All having their own likes and dislikes. You may or may not have lots in common with other people around you in a public place, yet social norms say it’s kinda awkward just to go out and say hi. Hence you never really know if you have things in common. They could be your next best friend. Your next door neighbor. Your cities banker. Florist. Gymnast. We never know cause we never ask. We never really have a need. Unless you are going to be asking them out, or are just super alone and become somewhat creepy and just start asking all the random people around you personal questions. Both are definitely awkward. But then their is something that can break that barrier. Break the barrier of our societies norms. A common interest, event, song, or even place. Something that makes everyone think the same thing. We all share a “moment”, and in those few seconds you feel like you are all friends or at least know each other. All going to the same school, concert, or even expo. Those are just a few basic examples. But then you got the really loud mean person at the super market, bank, Starbucks etc., where everyone else seems to look at one another and know what everyone is thinking about (“this person really needs to take a chill pill”). A very interesting event or social experiment that has become more prominent is a thing called “Flash Mobs”, a group of people gather in a very public place (i.e mall, town center, supper market etc.) and break out in song, dance, or some king of performance. For those few min everyone has a common interest, common thought, you no longer feel very alone for those few min. It somewhat brings the focus away from you (which we are all so used to) and puts the focus on everyone else around you. A refreshing feeling to say the least. Well, I want you to meet Carlos. He is the social experiment guru. He is the absence of shy. He breaks the social norms everyday. While everyone else tells him that he should act this way or that way, he acts another. He is rude, speaks his mind, colorful, and is a bird. 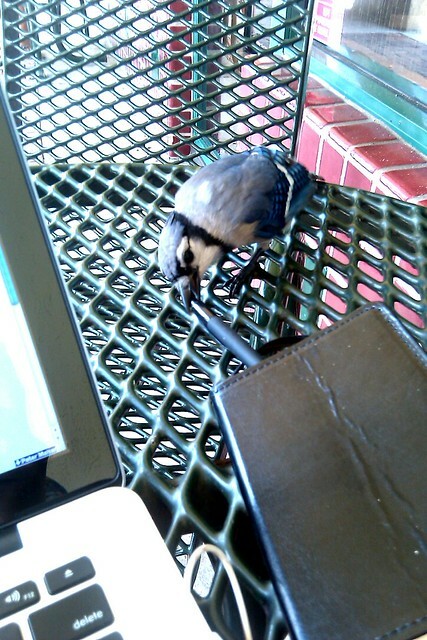 A Blue Jay to be exact. 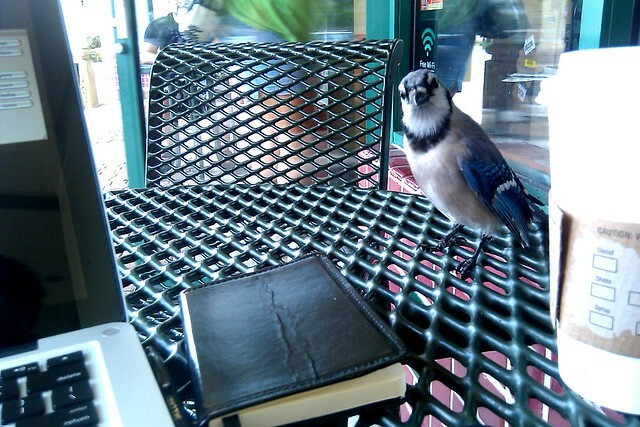 He lives at our local Starbucks and will venture down to the tables where the other guest sit. He will gladly help himself to your coffee, pastries, and even electronics. And yes he doesn’t bother to ask. He will even let you hold him. He swears he doesn’t have rabies but I think differently. Few other interesting things you will find with Carlos is that he likes cigarets. He knows it’s a nasty habit but he thinks it makes him better with the ladies. They all think it’s cool and laugh when he does it. I have even been able to convince people that Carlos is my bird. I mean that guy loves me the most. We are on first name terms, he loves my Apple products, and he will even pose for my pictures. So we are basically best friends. But no one "owns" Carlos. He would say he is his own man. The master of his fate, all that Mojo. Just don’t try to tease Carlos, he wont like it and he is not shy to use his beak to teach you a lesson or two. You respect the Carlos, or else. But what is my point in brining him up? Well most birds are shy, but Carlos is not most birds. 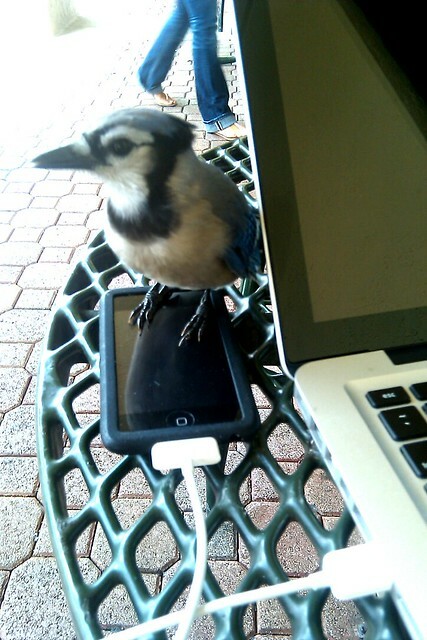 When you are sitting outside and Carlos boldly hops over to your cell phone and starts pushing buttons, normally a few brushes of the hand would make other birds flutter away. To get Carlos off your stuff you have to literally push him away. Like a determined child wanting a cookie, Carlos will stop at nothing to get what he wants. He has even gone to great lengths to get some weak minded women to buy him a fresh pastry. However, all his rudeness aside, there is one thing I can thank Carlos for. He brings the people outside of Starbucks together. We all get to share a moment in the hot florida shade. We all get to share a felling of joy and commonality. We all break out of our social norms and become friends if even just for a moment. So for that Carlos I thank you.